This was one of my favorite meals as a kid. I had a lot of trouble finding a simple dumpling recipe until I realized that my mom found this stew in an antique recipe book. I have tweaked it to include more modern ingredients. Brown the chicken in the olive oil in an 8 quart or larger stock pot. The wider the opening is on your pot, the better, so you have more surface area to make the dumplings. Add the onion and garlic and sauté until the onion is translucent. Add the carrots and celery and, optionally, the bell pepper. Sauté until slightly softened. Add chicken stock until the ingredients are covered plus room enough to float the dumplings. Bring to a simmer until the vegetables are softened. Add the peas and the optional corn and edamame. Add the parsley and season with salt and pepper to taste. Meanwhile, measure the flour, baking powder, salt, pepper, and herbs into a mixing bowl. Cut the butter into the flour with a pastry cutter or your fingers until the butter is in very small pieces. Add milk to the mixture slowly until the dough is thick and sticky like biscuit dough. Bring the soup to a boil. Drop the dumpling mixture into the soup by the spoonful. Reduce the soup to a simmer. 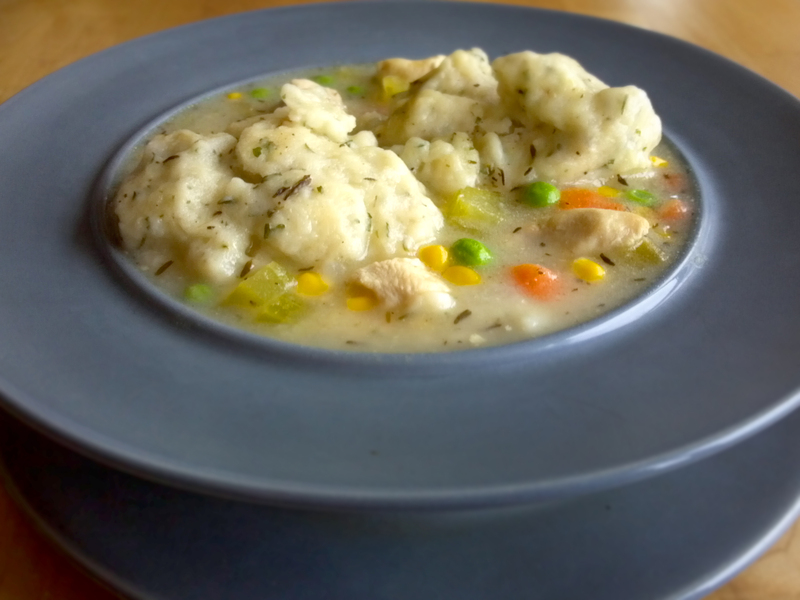 Using a spoon, gently push the dumplings down into the liquid and flip them over so that the tops get thoroughly cooked through. Simmer until you can break open a dumpling and it is thick, but not doughy in the middle. Serve hot. Note: This stew can also be made to be vegetarian. Dice and brown one package of extra firm tofu in a non-stick pan to replace the chicken. Replace the chicken stock with vegetable stock. The tofu should be added to the stew just before the dumplings so it doesn’t break apart.